Still crying yourself to sleep at night over the iPhone 7's lack of a 3.5mm headphone jack? Wipe those tears away - CES 2017 bears wired audio fruit for iPhone fans, thanks to a clever new case. 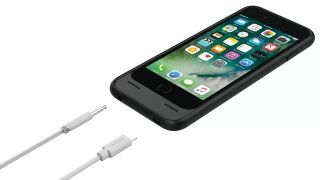 Incipio's iPhone 7 bumper case not only protects the edges of your smartphone, but also squeezes a headphone jack alongside its Lightning port in its elongated lip. With it attached to your handset, you'll be able to use a standard wired pair of headphones without resorting to Apple's 3.5mm adapter. Righting a wrong? Or a reductive wraparound? Sure, you're swapping out one accessory for another here. But the Incipio OX does have the advantage of letting you both listen to audio over a 3.5mm connection and charge over the Lightning port at the same time. “We wanted to bring the headphone jack back to the latest iPhone so our customers could still enjoy their favorite pair of traditional headphones without worrying about low-battery and sacrificing device protection,” said Carlos Del Toro, Director of Products, Incipio. It's as good a solution as you're likely to get at this point. Hitting shops in the first quarter of the year for $59.99 (around AU$83 / £50) the OX will come in black, purple and "forest" color options.